What’s it like where you are leading at the moment? Is the relationship between your organisation and its customers in balance, or are you having to work out how to handle your customers’ contexts in a more and more ad hoc way – riding your bicycle while re-designing it? Are the outcomes your customers want highly dependent on others’ services as well as your own – do you need to align purpose & activity with other complementary suppliers? What about the challenge & imperative of delegating more leadership and authority to those dealing directly with your customers, moving power to the edge of your organization where your customers interact directly with you…? If any of this is recognisable to you, then you are at work as a leader in an environment of asymmetric demands, where situational judgements, exceptions, variety, differences – all of these are more like the facts-of-leadership-life than predictability, balance, controls, planning. We call this asymmetric leadership. Customers’ escalating demands within increasing uncertainty and complex contexts. The challenges of personalisation & individualisation by an increasing number of providers’ networks. 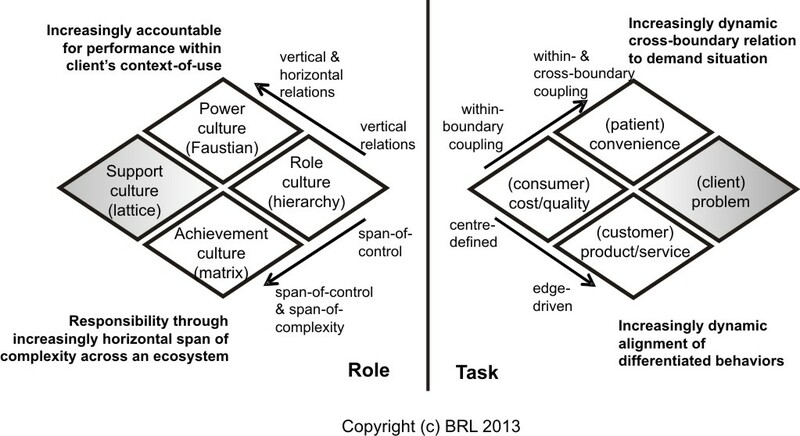 Aligning through-life support and condition management for the customer across organisational boundaries. Reducing duplication and eliminating waste, whilst increasing the emphasis on early intervention to secure long-term benefits. Trying to improve outcomes, especially in the case of complex needs. Facing increasing pressure to develop greater resilience and to contain upredictability. But how do you think and act in a context like this? What are the ways in which you can conceptualise what is happening that can provide some traction, give you a handle on the situation and create opportunities for improving the economy of your leadership effort? 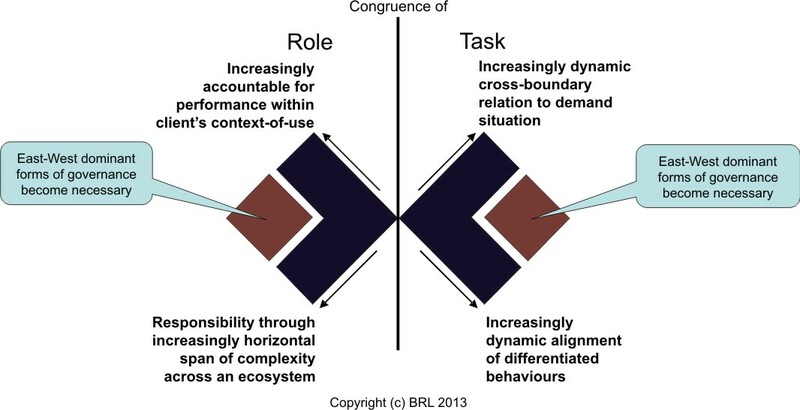 Map the ecosystem of organisations, customers and contexts within which you increasingly need to decide how to act. Consider how to strengthen horizontal accountability in ways which hold accountable the individuals who are dealing directly with customers. Develop the fractal resilience of the service systems you design and lead to cope with variation in the scale and scope of individuals’ needs. Establish economies of governance in the way resources can be brought together and combined in individual interventions. Define the indirect value for your customers beyond the immediate value arising from their involvement with your services. The leadership of learning from experience involves learning from direct experience of practice – what is sometimes called action learning. This approach depends on establishing a ‘transference to the work’ in the sense that the learning has to be allowed to emerge through engaging with the problematic nature of a situation in practice. 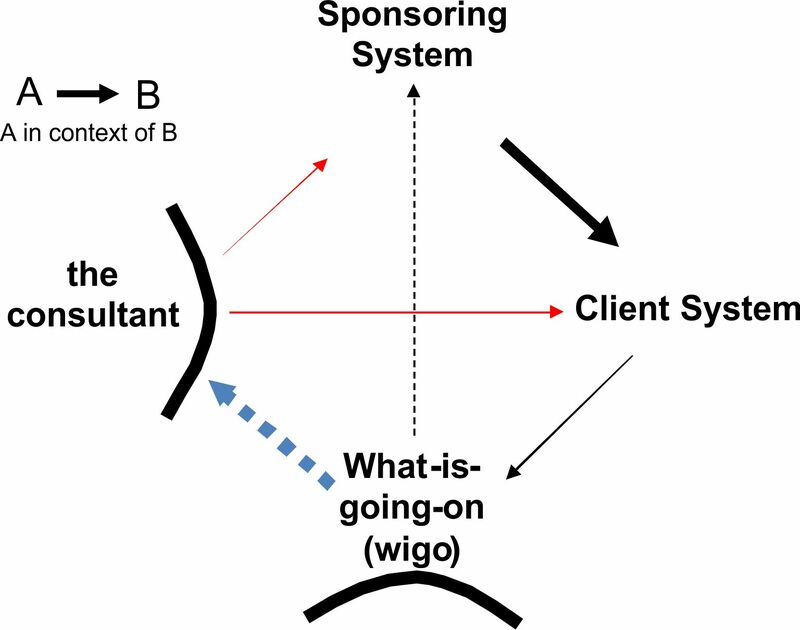 It contrasts with consultancy, in which the learning needed is b(r)ought in, based on a transference to the consultant. 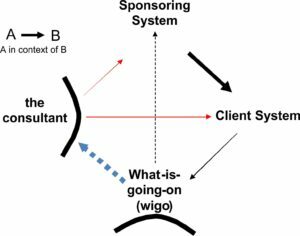 How this choice is taken up, between consultancy or action learning, will reflect the way power is exercised by the sponsoring system within the client organisation. It should add value (E): the outcome of the project should be to give the organisation a new ‘angle’ and new leadership in the way it creates value for its client. It should be practical (S): the project should be based on data, make effective use of existing capabilities, and the result of the project should produce ground-level consequences for the way these capabilities are used. It should ‘connect’ (W): the project should build on or take account of existing structures and ‘culture’ of vested interests, i.e. it must take notice of what is possible. It should matter (N): there should be an identified sponsor for the project to whom the team can relate and report. mobilizing commitment to change through joint diagnosis of business problems. developing a shared vision of how to organize and manage for effectiveness. fostering consensus for a new vision, competence to enact it, and cohesion to move it along. spreading revitalization to all parts of an organization without pushing from the top. institutionalizing learning through formalizing supporting policies, systems and structures. enabling strategies to be monitored and adjusted to problems encountered in the process of institutionalization. Using action learning projects as change agents to create a new ‘social architecture’, becoming the basis of networks, determining the intensity, substance, output, and quality of interactions; as well as the frequency and character of dialogue among members of the network. Defining with clarity and specificity the business outputs expected of the action learning project and the timeframe in which it is expected to deliver. Guaranteeing the visibility and free flow of information to all members of a network and promoting simultaneous communication (dialogue) among them. Developing new criteria and processes for performance evaluation and promotion that emphasize horizontal collaboration through networks, openly sharing these performance measurements with all members of the network and adjusting them in response to changing circumstances. The relation between these two axes parallels the relation between the two axes in the the plus-one process. The N-S-E-W refer to the balance that needs to be sustained by the governance system in order to overcome a North-South bias. 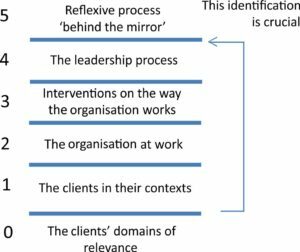 The use of this approach in one organisation is described in this paper on Marketing Project Groups. The challenges of this enabling role are described in this paper on meeting the challenge of the case. Type III errors of intent arising from leaving the project team’s own interests (and therefore valencies) out of the way the problem is formulated. The source of this list is ‘How Networks Reshape Organizations – For Results’, by Ram Charan, Harvard Business Review, September-October 1991. Some of the challenges surrounding the formation of network interventions are described in this blog on stratification. The senior management, knowing that they do not know while expecting the consultant to know, asks for consultancy. The senior management asks the consultant to provide people who know how to apply the solution. The senior management, knowing that they do not know while not assuming that anyone else knows better, asks for a technical assessment of the nature of the problem (expert). The technical assessment establishes what is known and what currently is not. 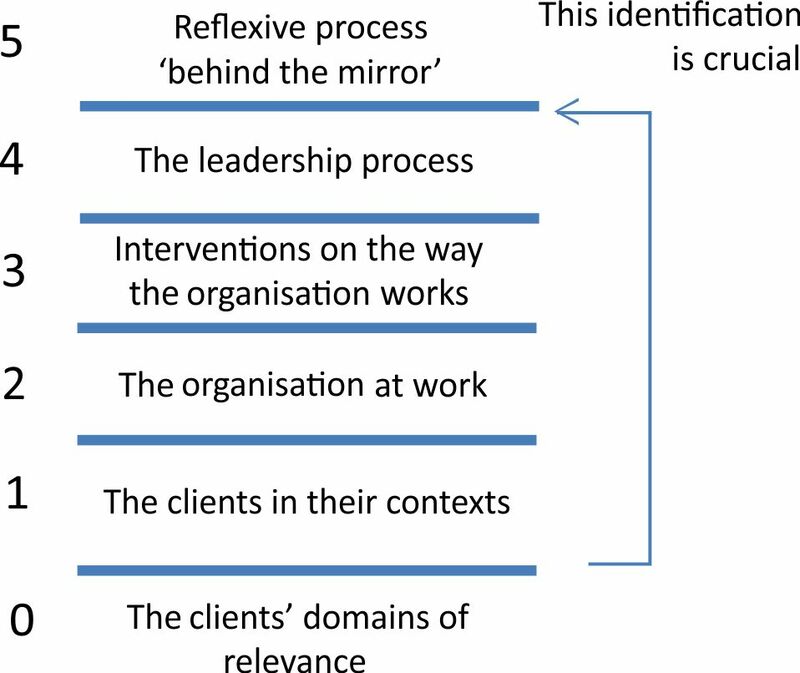 The senior management sets up an action research process aimed at making tractable what currently is not known (reflexive process). The action research process creates a way of solving the problem that can be used by senior management. 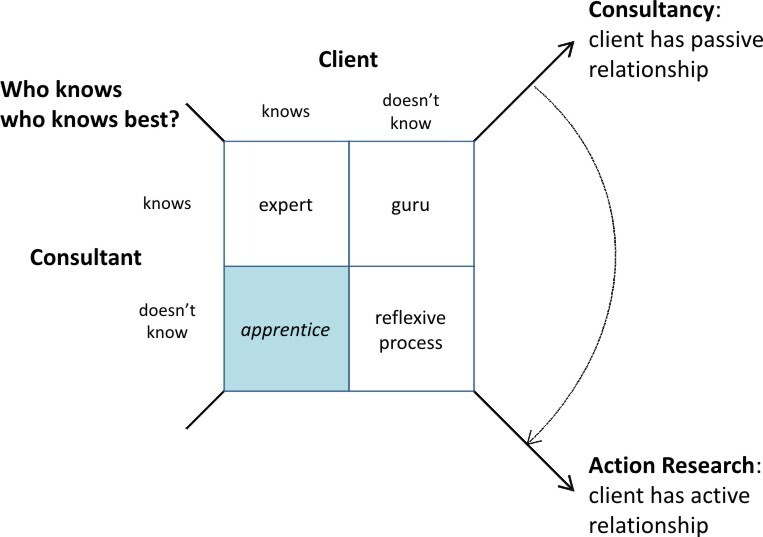 In the consultant’s approach there is a continuing asymmetry between the knowledge of the client and of the supplier, such that other suppliers are excluded. This approach may provide a quicker initial answer for the client, but leaves the client no better off in understanding the nature of the problem. 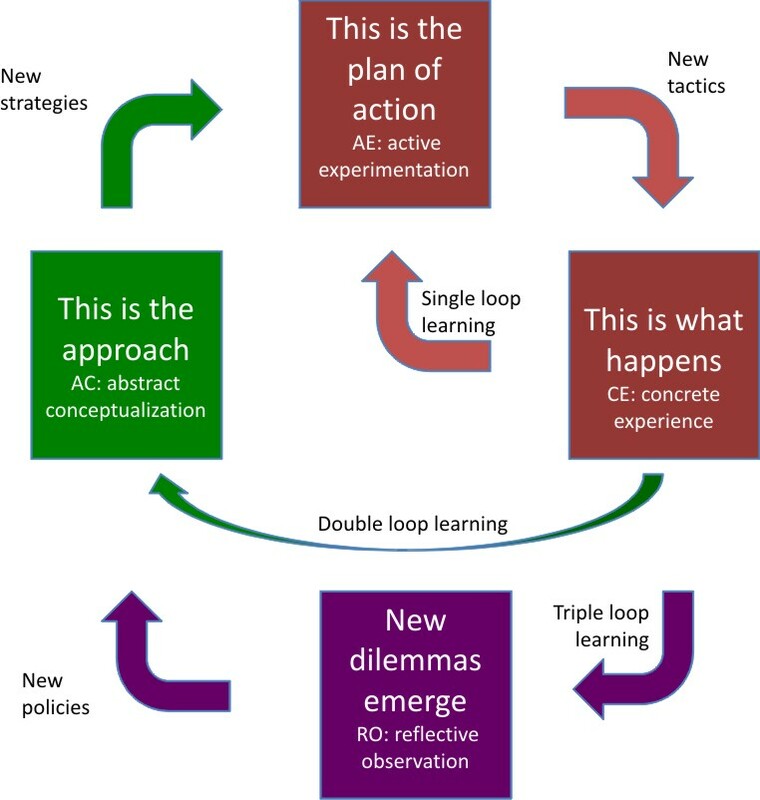 In contrast, the action research approach focuses all the time on removing asymmetries of knowledge between purchaser and provider such that the learning is joint. This is done by jointly identifying and working through the dilemmas emergent in the behaviours of the purchasing organisation in relation to its client-customers. This approach may generate better learning for the purchaser, but may not provide answers as quickly as senior management would like. Behind this difference is the question of whether the problem presented by the senior management is itself the problem to be solved, or a symptom of some other underlying ‘real problem’. If the former, then it is reasonable to assume that a supplier can know the answer even if senior management does not. But if the latter, then the problem is going to have ‘wicked’ characteristics and some form of action research process will be necessary, using some form of forensic process. ‘Wicked’ problems are problems with a circular definition – implementing a solution changes the nature of the problem affects what forms of solution can be effective etc. This concept of ‘wickedness’ was originally articulated by Rittel, H. and M. Webber (1973). “Dilemmas in the General Theory of Planning.” Policy Sciences. A more recent study in the context of Managed Networks in Health Care is Ferlie, E., L. FitzGerald, et al. (2013). Making Wicked Problems Governable? The Case of Managed Networks in Health Care, Oxford University Press.